Anywhere from 80-90% of the U.S. population drinks caffeine in some form every single day. More than 50% of people in this country drink more than 3 or 4 cups of coffee every day. To me, this is ridiculous. I’m sorry, but why are we so hard on alcoholics and smokers for being addicts, but it’s perfectly okay to drink a big gulp of coffeethat contains a colossal 640 mg of caffeine every day?I know: it’s so delicious and it’s a morning ritual. Nothing tastes quite like it, and that aroma! How would you ever wake up in the morning without coffee?! Oh, and it might be the only way you can do your business in the bathroom every morning. These are the rationalizations people have for their full-fledged addiction. Do you know what statistic goes right along with the 80% of people in this country who drink caffeine every day? Over 60% of Americans are overweight. Yep, I said it: caffeine is contributing to making us fat. Why do I believe this? Well, first off, I see it in my practice. 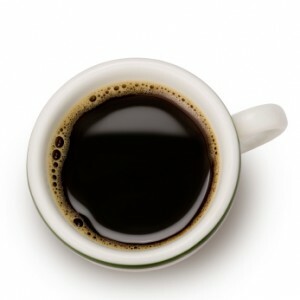 People take out their daily 6 cups of coffee and they start to feel more awake. They start having fewer headaches and their digestion improves. They start losing weight. But the proof is in the science: caffeine is a stimulant and it messes with your hormones and blood sugar levels. When you drink caffeine (often, the reason you drink caffeine), you get a burst of energy, and that’s because it stimulates your adrenals to kick out cortisol, which stimulates a blood sugar increase. It tells your liver and muscles to send out sugar into your blood to keep you awake. Drinking caffeine also stimulates a release of adrenaline, or epinephrine, which tells your heart rate to increase, and all your other fight or flight responses to turn on. If you were to be attacked in a dimly lit back alley, you’d have the same involuntary reactions as you do when you drink caffeine – maybe just at a more intense level. Your heart rate would increase and glucose would be sent into your blood stream so as to give you the energy you need to run away or fight. Your lungs would start working super well so that you could sprint away if necessary (which is why epinephrine has been used as an asthma treatment), your senses and reflexes would be heightened and you’d basically feel like you had super powers. Sounds AWESOME, right? Why would I ever suggest you NOT give your body this amazing sensation 4 or more times per day? It’s funny because heroin addicts probably feel pretty good when they inject heroin in their veins, too. But I digress. Let me make it clear before I go any further that I do believe that some people are way more capable of handling caffeine than others. Some people can drink caffeine here and there (or even a cup every day) without any ill effects. But most people will never give themselves the opportunity to find out what kind of an effect it really has on them because they’ll never go without it for more than a day or so (because after a day or so, the heinous detox symptoms arise: headaches, nausea, moods swings, fatigue – caffeine is starting to sound more and more like a real drug…). The more often you drink caffeine, usually the less it peps you up. Most people need to detox in order to really see how it’s affecting them. If you think you’re one of those people who’s not affected by caffeine, I double – no triple – dog dare you to stop drinking it for a few weeks and then have a cup of coffee. Then decide how much it affects you. Back to the science. Where were we? Oh yes, super powers. Basically, every time you drink caffeine, you’re simulating a horrendously stressful event in your body. Every time you go to Starbucks or crack open a can of Coke, you put your body through what it thinks is a mini Viet Cong ambush, a three car pile up, or a fight with a lion. I’m not exaggerating. That’s why you feel awake after drinking it. Any one of those events would knock you straight out of a dead sleep with eyes wide, senses reeling, superhuman strength intact. Those things are fine when they happen every once in a while – that’s what the fight or flight system is in place for: to keep you alive when occasional stressful things happen. But when you start overtaxing the system, things start to go awry. If this is the case, what do you do instead of drinking caffeine? EAT FOOD. Most of the time when people start regulating their blood sugar by eating protein, unrefined carbs and good fat at every meal and snack (and eat regularly – like every 2 or 3 hours), they find they don’t need the coffee anymore. They’re awake when they wake up in the morning – not in some low blood sugar stupor. The blood sugar spike that the cortisol creates plummets into a blood sugar crash just as quickly, which is why you get the munchies an hour or so after that cup of coffee. And which is why everyone gets tired at around 2-5pm. It’s a blood sugar roller coaster and there’s going to be a giant dip in the ride every afternoon when you start out on a swooping high from your 4 cups of coffee every morning. In summation, eat your breakfast, lunch, snack and dinner, and even add a snack in there somewhere else if you need to. Don’t eat (or drink) refined sugars, stay away from grains, and eat plenty of protein and fat. In other words, eat Paleo. Step away from the coffee (or Coke or whatever) slowly if you need to, and you may just find that you can wake up, fall asleep, do your business in the bathroom, and have enough energy without the aid of your favorite drug. Let us know your own experiences with caffeine!